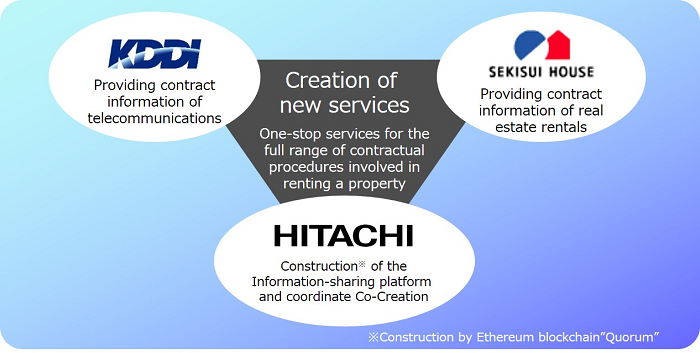 Tokyo, March 19, 2019 --- SEKISUI HOUSE, Ltd. (TSE:1928, "SEKISUI HOUSE"), KDDI CORPORATION (TSE:9433, "KDDI") and Hitachi Ltd. (TSE:6501, "Hitachi") are collaborating on the establishment of an inter-enterprise information-sharing platform that will enable companies to share proprietary data in a highly secure environment, and to create new services by pooling data from different industries. The initial project in the new effort is aimed at making real estate rentals more convenient by streamlining administrative procedures for residents, from initial property viewing to taking up residence. The joint verification test by the three partners begins in April 2019. 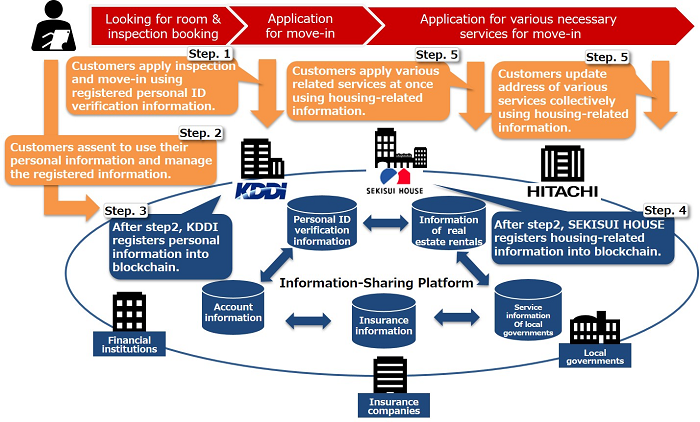 Securely sharing SEKISUI HOUSE group companies proprietary information and KDDI's personal ID verification information via inter-enterprise information-sharing platform constructed by Hitachi subject to agreement by the customer whose ID is being verified. The pilot project will verify the effectiveness of one-stop services for the full range of contractual procedures involved in renting a property, from the initial application for a property visit to contract signing, fixed-line telecommunications, electric and gas utilities, etc. Promote co-creation aiming at commercialization of inter-enterprise information-sharing platform, gather a wide range of participating companies and groups to form an ecosystem, and aim to create new services by combining data among different industries in future. Aiming to achieve a "super-smart society,"*1 the government has set forth its Society 5.0*2 policy initiative, aimed at creating new user benefits and user-friendly convenience through the application of digital technology and the utilization of data. The effort calls for establishment of platforms that enable inter-enterprise information links, mutually complementary utilization of data among different industries, and linking of services. The sharing of information among different industries requires fair and equitable dispersed cross-holding of information by participating companies, rather than exclusive proprietary management of information by any specific company. Blockchain technology makes information highly tamper-resistant and highly available*3. The resulting ability of multiple companies to safely share information makes this an apt technology for data sharing. In recent years, the field of personal data management has seen an increasing trend toward the concept of individual control of one's own personal information. In order to effect the strict management controls required by inter-company contract information sharing, it will be necessary for only those companies authorized by individual customers themselves to access personally-linked data. The "super-smart society" is one in which the necessary things and services are provided in just the right quantities to those who need them when they need them. The diverse needs of the community can thus be met in detail, enabling everyone to receive high-quality services, so that the many differences in age, gender, geography and language can be overcome, resulting in vibrant, comfortable living. "Society 5.0":A concept put forward by the Japanese government, Society 5.0 is a vision of a new society and encompasses the efforts to bring about that society. Society 5.0's goal is to realize a prosperous, human-centric society that combines economic development with the resolution of social issues by leveraging revolutionary technologies (such as AI, IoT and robots) and various types of societal data. Society 5.0 is positioned to follow the four "societies": the hunter-gatherer society, agrarian society, industrial society and information society. Blockchain technology is used in highly reliable systems because it excels in minimizing the frequency and duration of stoppages and interruptions in the functions and services provided by those systems. Its superb fault-tolerance makes systems resistant to failure and able to recover rapidly from any failures that do occur. Personal ID verification to confirm a person's identity is necessary in the numerous and diverse administrative procedures involved in day-to-day living. When a person relocates, the repeated need to produce personal identification documentation and to complete the necessary forms represents a major burden. Separate procedures are required by each service company involved in the process, from viewing properties and concluding rental contracts to applying for fixed-line telecommunications, electricity, gas and other lifeline utilities. SEKISUI HOUSE has already built a real estate information management system using blockchain technology*4. KDDI and Hitachi have tested out an inter-industry alliance that uses blockchain and biometric ID verification systems together*5. The new collaborative tests will involve the construction of a neutral inter-industry data-linking platform using the Quorum*6 blockchain technology and Hitachi's Lumada*7. This will enable secure access to the personal ID verification data held separately by SEKISUI HOUSE and KDDI*8. The resulting mutual availability of complementary personal ID data will make it possible to streamline the ID-related paperwork involved in renting a property by using the address and telephone contact information entered by the customer upon applying to view a listed rental a property. It will also become possible to make one comprehensive application for all of the contracts involved in setting up the necessary utilities and services, such as fixed-line telecommunications and electricity, gas, etc. The test will also verify the system's potential for application to new business models and service enhancements, such as one-stop customized service packages. The real estate information management system was created using blockchain technology on April 27, 2017. KDDI and Hitachi began using blockchain technology with biometric ID verification for coupon redemption on July 25, 2018. The subject of the collaborative test project is Quorum, an Ethereum blockchain-based system. Ethereum refers to a blockchain-based smart controller construction platform and development project (no-agent automated direct transaction/payment systems). Quorum is an enterprise-focused version of Ethereum. These are solutions, services and technologies that apply Hitachi's advanced digital technology in order to generate value from customer data and accelerate digital innovation. The personal ID verification information used in the current collaborative test project includes names and telephone numbers, etc. The data has been prepared especially for the test project, and does not refer to actual people. Moving forward, SEKISUI HOUSE, KDDI and Hitachi will use the results of the test project as the basis for application of the inter-industry information sharing to fields such as finance and local government administration. Broad-based corporate and organizational participation will be solicited, resulting in the formation of consortium to build ecosystems that are mutually beneficial to both customers and companies. Upon gaining the assent of the individual customer, each company possessing proprietary personal information will be able to pool it at the platform. The resulting combinations of data will make it possible to benefit customers in new ways, and to increase convenience by expanding the industries across which contractual procedures can be consolidated. In addition, customers will have direct access to the inter-enterprise information-sharing platform, which will give them the ability to specify the content and scope of information disclosure to each member company. This will enable customers to restrict disclosure to the minimum necessary for personal ID verification, while enabling companies to provide an environment with access to services featuring high levels of added value.